The set reflects a new tendency in the U.S. Christmas culture. 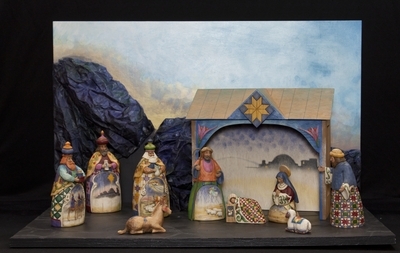 Jim Shore created this nativity set with painted figures for Enesco. The tradition of painted figures is part of a long history going back to pre-Columbian times. It slowly evolved from figures decorated with floral or geometric ornaments to sculptures showing tableaus of plants, animals, and entire landscapes. Subsequent development brought narratives into play when individual figures became the visual carrier of a whole story or shared in the story with other figures as suggested in our nativity set. Indeed, major episodes of the Christmas story can be "read" on each one of the figures. This tradition is well-known and was widely disseminated in Latin American countries."" Resin and wood painted figures depicting the nativity of Jesus, created by Jim Shore in 2003 in the United States. Exhibition label originally written by Fr. Johann G. Roten, S.M. for exhibit entitled "At The Manger" and held at Roesch Library, University of Dayton.